A powerful and persuasive report. It should help start an energetic movement to change the UN Conventions now. But the War on Drugs has become a huge cash cow for certain powerful entities. Thus, logic will not prevail until the corruption of the current system is thoroughly exposed. Good luck. Yes! "Good Luck" changing a terminally sick & insane society! Follow the money to its SOURCE. The international bankers are the biggest gangsters, the banksters, which dominated the political processes, and therefore, were calling the shots when their puppet politicians enacted drug prohibitions. Failures to understand political economy inside of human ecology lead to proposing "solutions" to these problems that continue to be too superficial do to anything really worthwhile. Unfortunately one can quite rightly say "good luck" with that, since our society appears to already be terminally sick and insane, because it is almost totally controlled by systems of legalized lies, backed by legalized violence, in the development of which the "drug wars" were merely another phase. Without deeper understanding of the ways that the death controls back up the debt controls, and therefore, wars based on deceits were deliberately designed to advance the overall social pyramid systems of debt slavery, then one can not understand the banksters' agenda enough to meaningfully counter-act it, or go beyond it. 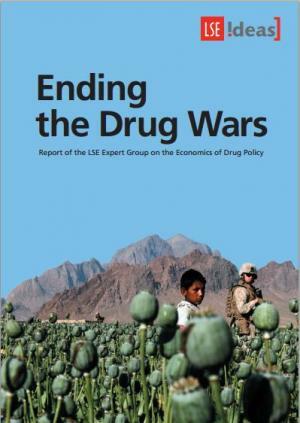 The mainstream morons who analyze the "drug wars" on the superficial levels that this report has done are practically political dead ends, because there are chronic political problems which are inherent in the nature of life, and our civilization has developed to resolve those problems through systems based on the maximum possible deceits and frauds. To propose viable solutions to ending the drug wars requires understanding war in general, which has manifested in the form of the combined money/murder systems. Viable solutions require using enough evidence, and enough of a scientific approach, to understand how and why governments became the biggest form of organized crime, controlled by the best organized gangs of criminals, which currently happen to be the banksters. The only genuine solutions require better organized crime, operating better death controls, to back up better debt controls. Anything less is based on deliberately ignoring the evidence and logical arguments about how human civilizations actually operate as energy systems, controlled by the methods of organized crime. The "drug wars" were NOT a "failure" from the point of view of the banksters, that controlled the governments, in order to deliberately create vicious spirals of wars based on deceits, which backed up the basic social pyramid of debt slavery, through the almost inconceivably crazy and corrupt monetary and taxation systems. To propose genuinely better ways to "end the drug wars" requires the first level of evidence regarding how civilization is actually controlled by the methods of organized crime, and then the second level of evidence regarding the chronic political problems inherent in the nature of life. However, after assimilating the factual evidence and logical arguments regarding that bigger picture, one returns to the problems of practical politics, and must conclude that: "logic will not prevail until the corruption of the current system is thoroughly exposed. Good luck." Reports produced by mainstream morons, who superficially analyze the "failures" of the drug wars are annoyingly useless, and lead to nothing but compromises with the same old lies, in the form of some neoprohibitionist regime, that is not really better, because that does not address the causes of what the real problems were, but only some superficial symptoms. Ignores the evidence that what actually happens was intended! deliberately promoted, over & over, in various forms! enough to come up with other "solutions," than neoprohibitionisms!